When you need a new foot for your UPLIFT Desk, we have you covered with the UPLIFT Desk Standard Foot for C-frame Desks. Order in the color that matches your desk: black, white, or gray. 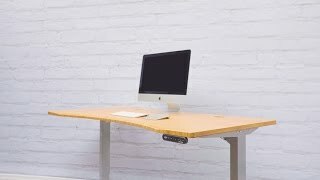 If you plan on switching to more compact desktop and need feet that won't protrude past your desk, the UPLIFT Short Foot might be the solution to your desk feet needs. The Standard C-frame Foot is compatible with C-frame desks only. Why would I need a new foot for my standing desk? If you lost, broke, or just want a different color foot for your UPLIFT Desk, these are the feet that you need to stay in good standing. These are sold individually, so if you want to swap out both feet, make sure you order a set. Will this fit on my T-Frame Desk? No, Standard Foot for C-frame Desks were designed to work on C-frame desks only. If you need a standard foot for a T-frame desk, we have you covered! If your desktop is more than 27.5 inches deep, standard feet will fit your desk. However, if your desktop is more compact, you will need a short foot if you ever need to replace your desk's foot.